The Office of Emergency Management is led by the Emergency Management Administrator. This office is responsible for coordinating the training, planning, and management of major emergencies or natural and man-made disasters. To better prepare City personnel and members of the Irvine community in the event of an emergency, the bureau actively participates in local, county, state, and federal exercises utilizing a highly trained staff and state-of-the-art technology. 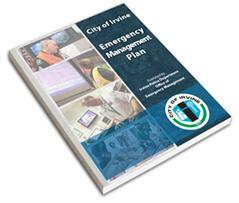 The following pages have been developed to assist the Irvine community in emergency awareness and provide valuable information resources related to disaster preparedness.